Super easy slow cooker recipe for a flavorful, tender whole chicken. Spray the chicken lightly with oil. Sprinkle liberally with the seasoned salt. 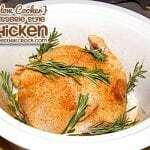 Arrange rosemary around the chicken.